Audi greets spring with a price announcement for the 2013 Audi RS 5 its V8 drop top rocket. The price claim we believe, but the fuel economy claims raise some eyebrows. With the coming of spring, Audi has announced pricing for one of the best grand-touring automobiles on Earth, the 2013 RS 5 Cabriolet. As spring approaches Torque News writers and readers look forward to placid days sitting watching the robins nest and planting some bulbs. Perhaps maybe tending to our garden. Not. We run to the garage on the first sunny day over 35 F, pull back the car cover and reveal our back-roads, drop-top blaster. Any one of us lucky enough to be in the tax bracket required to own this Audi S5 would be crazy not to consider it. The 2013 Audi RS 5 Cabriolet is in a very exclusive club. To be in the club you have to have a V8 and have a convertible top, and you have to have all of the best possible cabin amenities. You also don’t get to play unless you have power to the rear wheels. Audi applied for a variance to the club because the front wheels are also driven, and membership was quickly granted. Club members enjoy long drives on roads that are not highway, nor side street, but in between. The more curves and elevation changes the better. If there is a destination at the end of the road, all the better, but that is not a prerequisite. Driving the 2013 Audi RS 5 Cabriolet does require driver involvement, but it is all smooth style and done mostly from the right foot and fingertips. The RS 5 has Audi’s wonderful S-Tronic, dual-clutch seven speed transmission. Audi and VW have put more work into this style transmission than any other automaker and the results show. Moving up and down the rev band is smooth and all the revs match all the time. For grand-touring there is no better combination than a dual clutch automatic and a V8. Please note there is room in the comments section below for those who disagree and your comments are welcome. With 450 hp on tap the RS 5 is never wanting for pulling power. Audi says 0-60 mph comes in just 4.9 seconds, which means it actually takes less, more like 4.5. If you have a toupee attachment system rugged enough you can go up to 174 mph in this car. 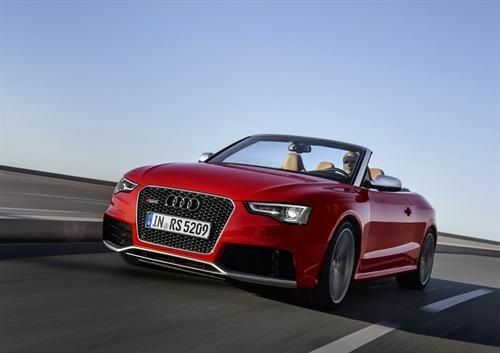 Audi has announced a starting price for the 2013 RS 5 Cabriolet of $ 77,900.00. That is a steep climb for many on a budget, but considering this is a 3 season car at best, it will last its owner a long time. Those with $78K in their piggy bank may need to save a little bit longer because the RS 5 will have a long options list that most cars built for dealer inventory will come with. For example, the car can be equipped with ceramic brakes for an added $ 6,000.00. That is not the package price, just a brake upgrade. Oh, and just the front rotors are ceramic. That is the first time we have heard of just two of the four rotors being made from ceramic instead of all four. Remember, ceramic brakes generally reduce fade from track use. So there is almost no performance difference on-road. Audi’s announcement today also included the headline “Class Leading Fuel Economy.” The EPA estimated mileage for this AWD V8 powered car is just 16 city and 22 highway mpg. Combined that equals 18 mpg. Apparently every car has to have some green car claim now. We looked at this fuel economy and almost laughed, except it isn’t funny to make claims about fuel economy anymore since Hyundai spoiled all the fun. By comparison to this car, the rear-drive, V8 powered Chevy Camaro SS Convertible with a 6 speed manual gets 19 mpg combined. That car is almost identical in terms of performance to the Audi S5. The Lexus IS350C hard-top convertible can sprint to 60 mph in 5.3 seconds, less than four-tenths separating it from the RS 5’s claimed time, and it achieves 22 mpg combined. Apparently, the convertible grand touring competitors Audi meant are all German manufacturers and all begin with A. Fuel economy claims aside, the 2013 Audi RS 5 Cabriolet is a grand touring car with no compromises and is on sale now, starting near $ 80K.